I don’t have to waste space storing videos and DVDs, and I can mix up my routines by simply downloading different video podcasts. What if you didn’t have any kind of an emotional or physical connection to the person who was nagging you to keep moving? This week’s workspace of the week is Jake Loupe’s well-organized garage. Should I keep or dump my old journals? Keep your crutches from becoming life clutter. It is always a risky decision to make when competing formats are at each other’s throats for market dominance, but what if your early adoption choice is on the wrong end of the format wars? My wife uses her mini van as an office for her process serving business, and a shuttle bus for taking our children to and from various events plus all the household shopping. Her process serving business involves carrying multiple files that need served and ones that have been served. She also uses duct tape to post papers on doors, flashlight, mace, and a gps. She uses a plastic grocery bag over one of the arm rests for a garbage bag and she carries all the coupons in her van since she never knows when she will need one. All of these items are kept in between the front seats, door pockets and overhead visors. Needless to say the van can get cluttered quite quickly. This drives me crazy when we use her van for family trips. What suggestions or gadgets have you come across for organizing a vehicle? Any suggestions would be appreciated. The same rules you use to keep your home uncluttered should apply to your car. Specifically, I’m thinking of the Unclutterer motto: “A place for everything and everything in its place.” The reason the car is becoming cluttered is because none of your wife’s items have a “place” in the car. The prices might initially seem a little steep (most are between $100 and $200), but when you compare them to the costs of traditional office furniture, they’re incredibly less expensive. And, it is her office. Just because she works in a car doesn’t mean she has to sacrifice all of the benefits of a conventional office. 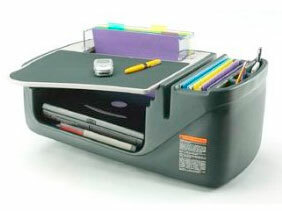 A coupon organizer would be a great solution for her coupon collection and could be stored in the auto desk unit. And, a large litter bag would also be a nice addition to keep trash under control. As far as posting papers around the car, you might consider using sticky tape to adhere a cork or metal strip to the front of the glove box. Then, either with thumb tacks or magnets she could hang the papers there instead of using duct tape throughout the car. Thank you, Jim, for submitting your question for our Ask Unclutterer column. My hunt for a perfect chair is finally over … this vintage chair I scored at a flea market yesterday. I just re-uphostered the cushion with linen and Voila! It’s a perfect match and I’m absolutely loving it. Again, this desk is DIY. I couldn’t find the right size desk top (small enough to fit in our tiny dining room), so I bought this pine wood panel, had it cut, pained it in white and added the legs from IKEA. Thank you, AlmostBunnies, for your submission to our Flickr group. Give away any books that you don’t plan on reading or referencing again, are in the public domain, and can be found in their entirety online. Keep the leather-bound copy of The Scarlet Letter that your grandmother gave you on her deathbed. Check out the article to learn the other three tips! As an adoptive parent with six months of making bottles under my belt, I can 100 percent attest to the fact that merely shaking a bottle will produce a wonderfully consistent meal for my son. No electricity is needed to power my arm while it shakes. I don’t need to toss my arm in the dishwasher afterward, and I don’t have to buy my arm seeing as it’s already attached to my body. 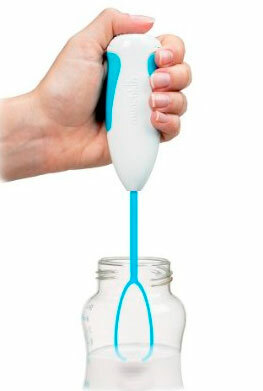 Since you have to continuously hold down the power button to use this item, I don’t understand how it is in any way better than simply shaking a bottle. Oh, Unitaskers, how you make me smile. It is a wise person who can learn as much from failure as success. A Never Again folder on your computer might help you be more productive in the future. 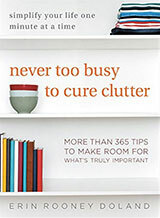 Real Simple has a helpful list of causes for clutter. You can now take your broken or out of date electronics to your local Best Buy. 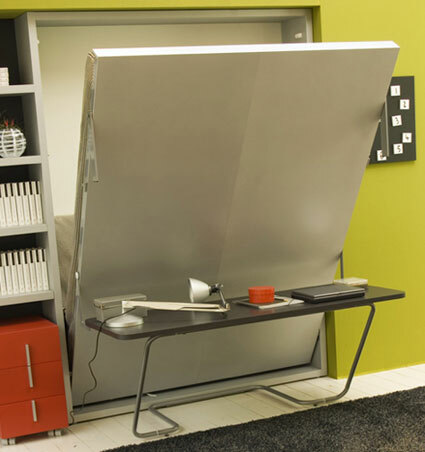 And, I am quite fond of the Poppi Ponte single bed that unfolds to reveal storage in addition to the bed. 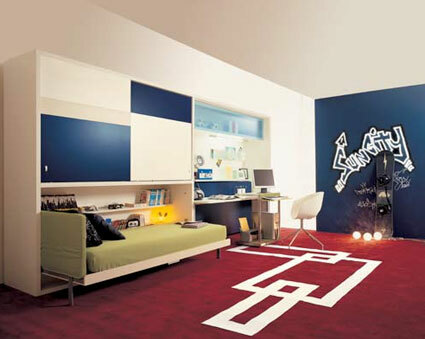 When space is limited, wall beds are a great way to to get multiple uses out of the same room. 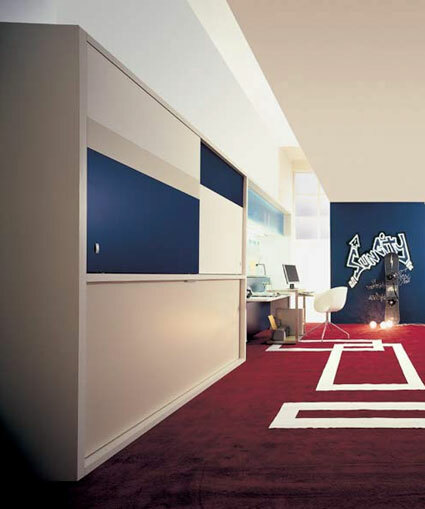 These designs also remind me of the lofted bedrooms by Tumidei. If you turn to page 158 of the issue, and search diligently, you can even spot a quote from me (hunting for it is like playing a game of Where’s Waldo?). This was my first time being quoted in O, and I was thrilled they thought of me for their big “De-Clutter Your Life!” issue. 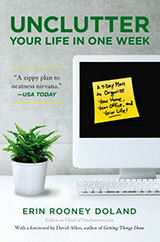 There are many great tips to be garnered from the March issue of O. Also, the items that Oprah decided to pitch from her closet are being auctioned on eBay starting March 1, and proceeds with benefit her Leadership Academy. Have you ever been on a road trip, driving down a long stretch of highway, and suddenly become mindful of where you are and what you’re doing? You don’t know where the last few minutes went, but you are instantly aware that you had zoned out for awhile. You weren’t asleep; you just weren’t alert or present to the task at hand. I’ve been on the Metro and had a similar experience. I’ve ridden past my stop because my mind was focused on something that had happened earlier or wasn’t focused on anything at all. I was absentminded because I wasn’t mindful of what I was currently doing. When we operate on auto-pilot in our lives, we cease to be aware of what is happening right now. A man on the street will hand you a flier for a shoe sale, and you’ll put it into your pocket without thinking twice. Then, the flier clutters up your coat pocket for days, maybe weeks, because you don’t even remember it is there. Had you been mindful when you were on the street, you wouldn’t have taken the flier in the first place. A significant amount of clutter in our homes could be eliminated simply by being more mindful in the present. Mindfulness helps you to make significantly fewer impulse buys, you throw out junk mail before bringing it into your house, and when you spot clutter already in your home you take care of it immediately (recycle it, trash it, put it in a donation box) instead of pushing it aside and letting it continue to bother you. I’ve also found that if I’m tired, I’m more likely to be absentminded. (There is a direct correlation between how many typos make it onto Unclutterer and how much sleep I had the night before I edited the article.) Keeping up energy levels helps a great deal with being mindful. If you’re not in the practice of staying mindful, consider temporarily putting up post-it notes around your home or office that say “What are you doing right now?” A note on your computer monitor, one on your bathroom mirror, another near your mailbox, and another one on the door of your microwave are good places to start. A second idea might be setting a timer on your computer with a recorded voice saying “What are you doing?” to sound every 15 minutes. Also, keeping up your energy levels is a plus. What do you do to help you stay mindful in the present? I’ve tried the post-it note idea and had decent success with that strategy. However, I found I needed to change the post-it note every few days (switch up my handwriting, change to a different color of paper, and move the location slightly) so that they continued to grab my attention. I was recently inspired during the days before Chinese New Year (which started on February 14) to clean the entire house and do some necessary baby proofing in the process. It is a custom in China to thoroughly clean your home before New Year’s Eve to get rid of the bad luck of the previous year. It’s similar to the “out with the old, in with the new” idea many in the U.S. express in late December, but taken more literally. Get rid of the old — especially the dust and dirt — to make way for the new. Start at the top. If you’re cleaning a room, this means starting at the ceiling and moving your way down to the floor. You’ll inevitably stir up dust and other non-desirables, which means if you start at the top you’ll never have to clean a surface twice. Use the least caustic cleaner first. I think this is a tip I picked up from an episode of Martha Stewart Living, and it’s a good one. The less dangerous a cleaning agent, the easier it is on what you’re cleaning and it is almost always less expensive. You wouldn’t bring a cannon to a thumb wrestling tournament, so you don’t need to haul out the big guns unless you really need them. Plus, if you have kids or pets, you don’t have worries about accidental poisonings cluttering up your mind. Be safe. If you need to move up the caustic cleaner scale, make sure you aren’t using one cleaner that can interact with the residue of the previous product (like don’t use an ammonia cleaner with or on top of a bleach-based cleaner). Keep the area ventilated, wear eye and breathing gear if recommended by the manufacturer, and store the chemicals under lock and key. Read all packaging to ensure that you are being as safe as possible. Don’t feel you need to take on cleaning your entire house all in one weekend. At Chez Doland, we deep clean the kitchen and dining room on Monday, Bathrooms on Tuesday, Bedrooms on Wednesday, Living and family rooms on Thursday, and Friday is for the foyer, garage, and laundry room. After a 10 minute general pick up around the house, we focus for 20 minutes on the targeted room. Don’t tackle cleaning alone. If you live with other people, equally split up the tasks. If you live alone, call in a cleaning service every once in awhile to give yourself a well-deserved break. 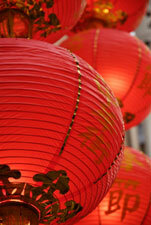 Happy Chinese New Year, everyone! Feel welcome to add your cleaning tips in the comments section of this post. At the beginning of every day, I set aside five minutes to plan my perfect day. It doesn’t always turn out exactly the way I expected, but it rarely gets completely uprooted. Also, the plan is more about putting anxieties to rest than a rigid to-do list. If you want the high-end clients you’ll just have to make sure that all hamburgers are served in an elegant walnut and polished aluminum Chompr. No more heavy, brick-like containers to carry your plug converters while on vacation or business travel. A single power cord is a brilliant idea. However, I worry that Micro-USB may be irrelevant in three-years’ times. What is the best way to eliminate the cable clutter from my wall-mounted flat screen TV in order to give it a clean look? Never let anything cross the threshold of your home unless it’s something that you know you need or that you know you will love and cherish for a long time to come.